Koalas are not bears. They are not placental or ‘eutherian’ mammals, but marsupials, which means that their young are born immature & they develop further in the safety of a pouch. It’s incorrect to call them ‘Koala bears’ – their correct name is simply ‘Koalas’. Koalas measure about 60 to 85 centimeters (24 to 33 inches) long, and weigh about 14 kilograms (31 pound). Eucalyptus leaves provide moisture and they don't have to drink water. 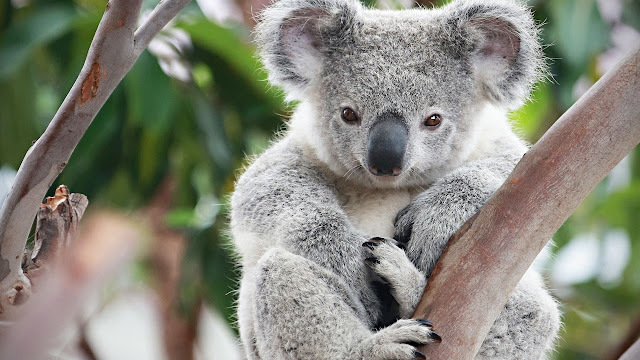 Eucalyptus is toxic, but koala's digestive system eliminates toxins without inducing damage. The koalas cute and cuddly looks makes them is one of the most loved marsupial mammals to people of all ages. Koalas spend most of their time in trees. They climb using powerful limbs and sharp claws. Two fingers are separated from other fingers, which help them grab and hold branches. Koalas have large noses that are coloured pink or black. Koalas are the only animals, besides primates, that have fingerprints. In the wild Koalas can live 12-14 years. But if someone is taking care of them, or if they are in captivity they can live 16-20 years. They sleep 16-18 hours per day. Koalas are found in the eucalyptus forests of eastern Australia. They have grey fur with a cream-coloured chest, and strong, clawed feet, perfect for living in the branches of trees! Koalas are territorial animals. They have couple trees that are used as "homes". Area covered by these trees is called "home range". A joey grows and develops in the pouch for about 6 months. Once strong enough, the youngster rides around on its mother’s back for a further 6 months, only using the pouch to feed. They produce various sounds that are especially loud during mating season. They can snore and scream. They are nocturnal animals and they eat 1.1-2.2 pounds of leaves each night. Koala’s grow up to become big eaters, shifting up to 1 kilogram (2.2 pounds) of eucalyptus leaves in a day! They are fussy, too, and will select the most nutritious and tastiest leaves from the trees where they live. 35 days after mating, baby koala will be born. It is only 2 cm long, hairless, deaf and blind. It instinctively crawls to the mother's pouch where it will finish its development. Koalas almost never need to drink water, getting sufficient water from the leaves they eat. In times of drought or when food is scarce, they will drink water from streams and the like, if necessary. They have poor eyesight, but excellent sense of smell, which helps them find type of eucalyptus they like to eat. Koalas are nocturnal marsupials famous for spending most of their lives asleep in trees. During the day they doze, tucked into forks or nooks in the trees, sleeping 18 to 20 hours. Out of 700 different types of eucalyptus, koalas eat only 50 types. Whenever koala communicate with each other, they are using several types of noises. They rag, and sometimes they sound like a snoring! Koalas live between 10-14 years in the wild and over 16 years in captivity. Koalas have a scent gland on their chest that they rub against trees to mark their territory. Koalas only spend 15 minutes a day in social activity. Koalas in the northern parts of Australia are smaller and have grayish fur. Those in southern parts of Australia are larger in size, have longer, brownish fur. Koala was hunted until the 1920s, after which the Australian Government was forced to protect them. Unfortunately, many koala had been killed before, and since then have become extinct animals. Fortunately, they reproduce and are protected from hunters. However, the habitat for the koala is disappearing and they are actually endangered species. The Eucalyptus tree is not protected and as more of these trees are cut down, the numbers of Koalas are reduced. It is estimated that there are likely to be less than 80,000 Koalas remaining in Australia today and it could be as low as 43,000. Koalas cannot be kept legally as pets. Koala facts teach us that while there are more than 600 varieties of Eucalyptus available in the Koala’s habitat, the animal really loves to eat roughly 30 of these species. Babies leave the pouch first time after 5.5 months. It will keep on coming back until it becomes too big to enter (around 8th months). Eucalyptus is poisonous to most animals. The koala’s digestive system creates bacteria that deactivate the poison. It is thought that koala means ‘no drink’ in some ancient aboriginal languages. Baby koalas are called "joeys". Like humans, koalas have fingerprints. They are the only other mammals besides primates to have them. The brain size of modern koalas has reduced substantially from their ancestors, possibly as an adaptation to the low energy they get from their diets.